U.S. Rep. Alexandria Ocasio-Cortez wore a $7,600 ensemble to the State of the Union address. The sartorial choices of the newly-elected congresswoman are often an object of internet obsession, but we saw no evidence that her State of the Union outfit was any more outlandishly expensive than that of her colleagues. Gold-colored hoop earrings, for example, can be purchased for as little as $5, a far cry from the $1,700 cost assigned to them in the meme. Although no designer has come forward to publicize their participation in Ocasio-Cortez’s outfit, Glamour magazine reported that internet sleuths went looking for the most noteworthy item: a white cape worn in lieu of a suit jacket. Some observers matched the cape with one made by women’s clothing retailer Zara, which sells for $89.99 and not $1,500. In terms of hair and makeup, Ocasio-Cortez had her hair wrapped in an uncomplicated bun and has even revealed she wears a brand of red lipstick that costs $22. 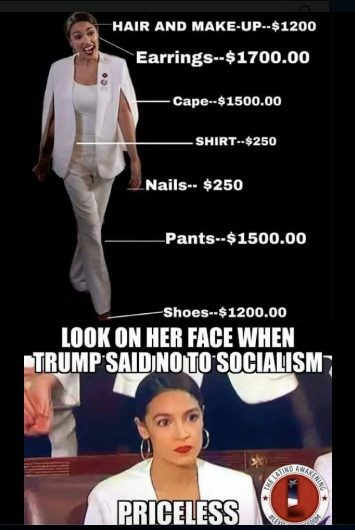 The meme contained no sources or evidence to support the claim that Ocasio-Cortez was decked out in thousands of dollars’ worth of clothing and cosmetics and appeared to be nothing more than another attempt to generate a viral rumor attacking the youngest woman serving in Congress. The Cut. 16 November 2018.